Note also that the color of the small tree that the tileset contains is different from the original game. Also, the small non-animated flowers of the forest are missing in the tileset. There is a reason why that is the case. I was working with a tileset that I originally made for a fan game, but the game was scrapped. As a result, some of the tile patterns appear different. 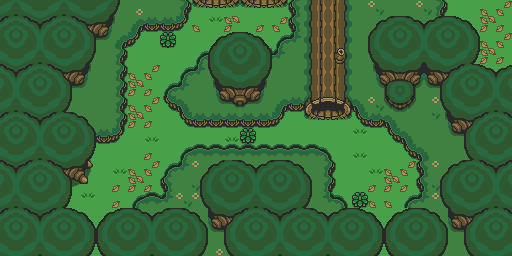 However I am going back into the tileset image and redoing a lot of the patterns to better closely match LttP. The tileset will also be better optimized. As for the location of the small trees, they are found in the section of the tileset with all the other trees and rock formations. The colors of the trees are located in the sections where the tree tops are.